In some older treatments, the organisms included within this group are classified within the Pyrrhophyta or fire algae (Chapman and Chapman, 1973). Although most dinoflag-ellates occur in marine waters, freshwater forms are also known. Most extant dinoflagellates are free-living components of the oceanic plankton, but saprotrophic, parasitic, symbiotic, and holozoic (heterotrophic) forms are present as well. They range from 5 pm to ~2mm (e.g., Noctiluca) in diameter and are characterized by two flagella of unequal length (heteromorphic) and different beating patterns (heter-odynamic) (Hausmann et al., 2003). One flagellum extends outward, but the other wraps around the equator of the cell (FIG. 4.37) and contributes to their unique mode of locomotion, by spiraling through the water. The adaptation of these organisms to a wide variety of environments is reflected by a tremendous diversity in form and nutrition, as well as an extensive fossil record (Hackett et al., 2004). Some dinoflagellates produce extensive blooms, called red tides. The toxic by-products of these organisms cause death to fish and shellfish, as well as higher organisms in the food web. Extensive fossil blooms of certain dinoflagellates were no doubt responsible for the formation of some oil deposits in the world, based on a comparison of 4-methylsteroidal hydrocarbons in petroleum deposits with 4-methylsterols in modern dinoflagellates (Robinson et al., 1984). Freshwater dinoflagellates have also been suggested as the source for some oils (Goodwin et al., 1988). 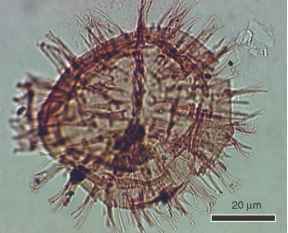 Fossil evidence for dinoflagellates is based on organic-walled cysts (FIGS. 4.34-4.36), sometimes termed din-ocysts, which are variable in size (25-250 pm in diameter) and shape. 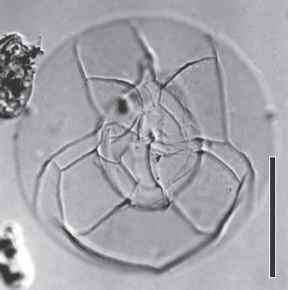 Since only about 15% of extant dinoflagellate species produce fossilizable cysts, it is highly probable that the fossil record represents only a small segment of the actual diversity of these organisms through time (Head, 1996). The wall of most dinoflagellate cysts consists of a substance similar to sporopollenin, which accounts for their excellent preservation as fossils. 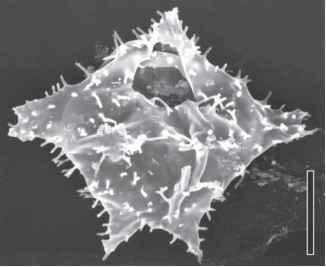 Other dinoflagellate cysts have calcified walls (see below). Cysts are subdivided by a transverse furrow (paracingulum) into an anterior epicyst and a posterior hypocyst (Evitt, 1985; Evitt et al., 1977). On the surface are numerous, polygonal paraplates separated from one another by parasutures; the plates and sutures are given numbers for descriptive purposes. 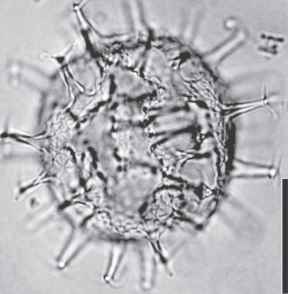 Some cysts are relatively smooth, whereas others possess various forms of ornament, ranging from spinelike processes (FIG. 4.38) to elaborate horns. 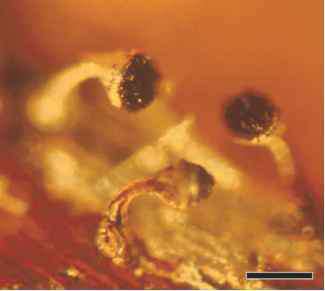 origin of dinoflagellates is substantiated by geochemical analyses that show a nearly continuous dinosterane record in Precambrian to Cenozoic organic-rich marine rocks (Moldowan and Talyzina, 1998; Moldowan et al., 2001). The hydrocarbon dinosterane is concentrated in and nearly exclusive to the dinoflagellates, so this chemical evidence strongly indicates that dinoflagellate lineages must have existed as early as the Precambrian. in younger Mesozoic shelf and slope sedimentary environments throughout the world (Keupp, 1992), and have been used as valuable proxy indicators for (paleo-)environmental conditions (Zonneveld et al., 1999). Important features in the classification of these fossils include ultrastructure of the calcific cyst walls, orientation of the crystallographic c-axes of the wall crystals (Young et al., 1997; Kohring et al., 2005), and position and configuration of the excystment aperture or archeopyle (Streng et al., 2004). What is dinoflagellates form of nutrition?